Ms. Mary Angelina Mei is considered one of the world's leading young harpists and pianists. Ms. Mei is an extraordinary performer and an excellent lecturer. A critic from the World Journal News calls her "a master of the heavenly angel instrument." "International Musicians Who's Who Encyclopedia"
"I realized when I heard Ms. Mei that I was in the presence of a master. She is a truly remarkable, world-class musician, and is among the top harpists in the world." "These hard-earned accomplishments rightfully put Ms. Mei in the category and league of the greatest musicians in the 21th century. She has my highest recommendations." 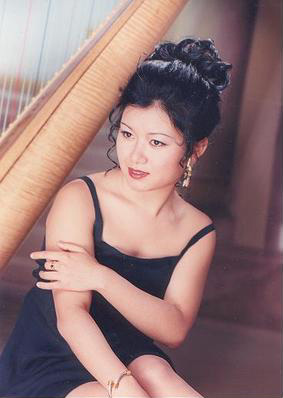 "Ms. Mei is highly regarded as a harp virtuoso by harp musicians and afficionados worldwide." "Ms. Mei's performance is outstanding and unequalled. Undoubtedly I found her to be one of the most talented harpists. Her artistry would definately be an asset to the musical world." "Ms. Mei has acquired an outstanding reputation as a harpist. She is a world class musician and one of the leading figures among the world's virtuoso harpists."